Savory, smoky, subtly sweet and satisfying! Oh, and mildly spicy too! What more can we ask for in a meal? 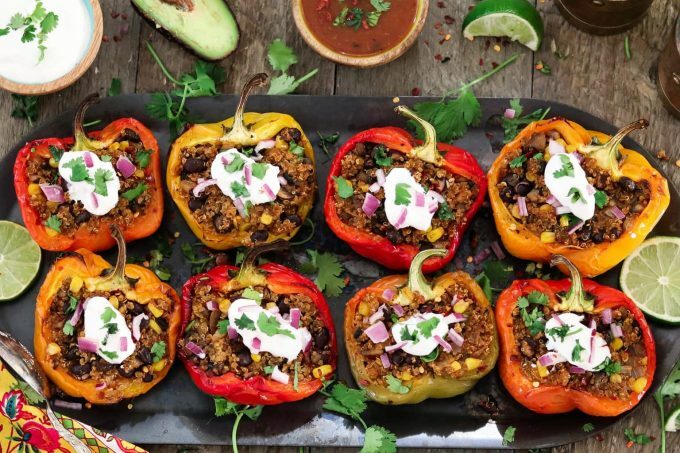 These Quinoa Stuffed Peppers are gorgeous to look at, and they’re packed with mouth-watering flavors that’ll make dinnertime fun again! Seriously though, these stuffed peppers really are the cat’s pajamas. 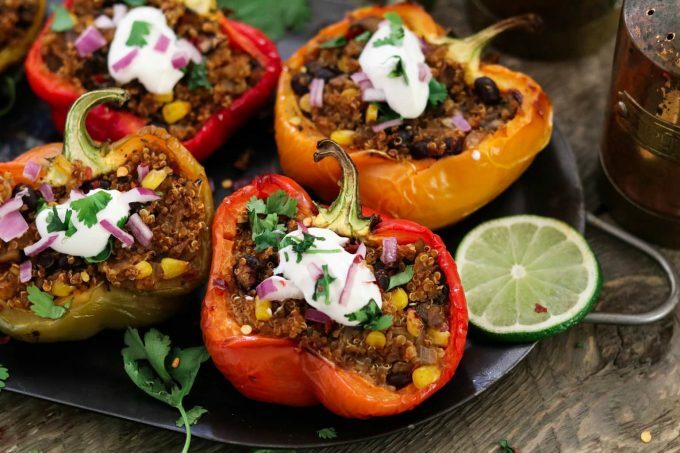 You may have seen these Stuffed Peppers before when Vegan Huggs just started out. I love the original recipe, but I wanted to simplify things and cut down the cook time. Less time in the kitchen sounds more appealing these days. Don’t you agree? Less time doesn’t mean less satisfying, and these stuffed peppers are just as enjoyable. Trust me! I really wanted to update the photos, too. I’ve come a long way in that department, so I gave these stuffed peppers a complete makeover. You won’t be leaving the table hungry…that’s for sure. The best thing is you won’t feel overstuffed either. 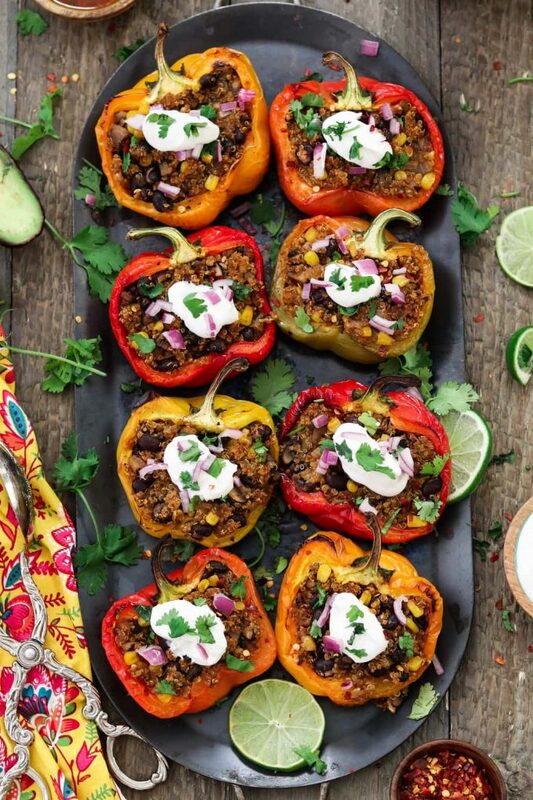 These Quinoa Stuffed Peppers are light, yet hearty and filling. Did I mention how healthy they are too? They are fiber-rich, protein-packed, and gluten-free. Yep, they’re healthy, but they aren’t lacking in the flavor department at all. 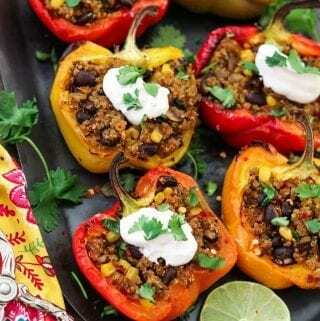 The mildly spicy and bold-flavored filling, melds together with the smoky-sweet roasted peppers, to create the most magnificent aroma and taste. If you love bell peppers as much as me, you also might like this Roasted Pepper Salad. It’s fresh, colorful, sweet, tangy and smoky. I made the stuffing by sautéing onions, garlic, and meaty mushrooms together. Then I added protein-rich black beans, fluffy quinoa, sweet corn, savory broth, and smoky spices. Holy moly, I’m getting hungry just thinking about it! This recipe tastes fabulous to me the way it is, but maybe mushrooms or quinoa aren’t your thing. No problem, just swap them out for your favorite grain and vegetable. They are practically fool-proof, so don’t worry about the rest. There’s really not a lot to this recipe. It seems fancy and time-consuming, but it’s actually quite simple and takes about 35 minutes to make. You can even prep the filling the day before, and pop it in the fridge. That will cut the time down even more, and make life easy. The hardest part is refraining from eating the filling until then. I never win that battle. Stuff the peppers and roast to perfection. 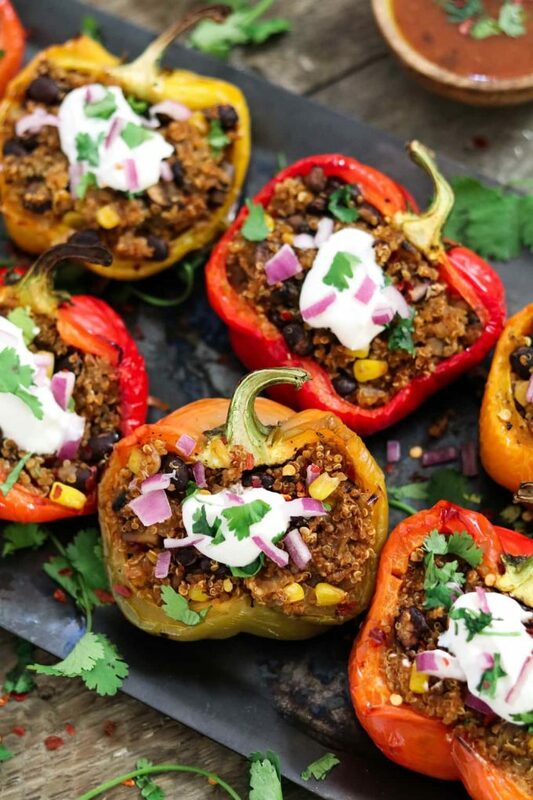 These Quinoa Stuffed Peppers are as complete as it gets, so you won’t need to dirty any more pots and pans. However, it does pair nicely with a simple salad if you want something extra. Or you can skip the salad, and go for a nice cold vegan beer, or margarita. It all works! They’ll be nice and quiet after a meal like this, so you can thank me later. If they’re staying the night, they can have one in the morning too, with a side of tofu scramble. Now that’s hosting done right. No fuss! 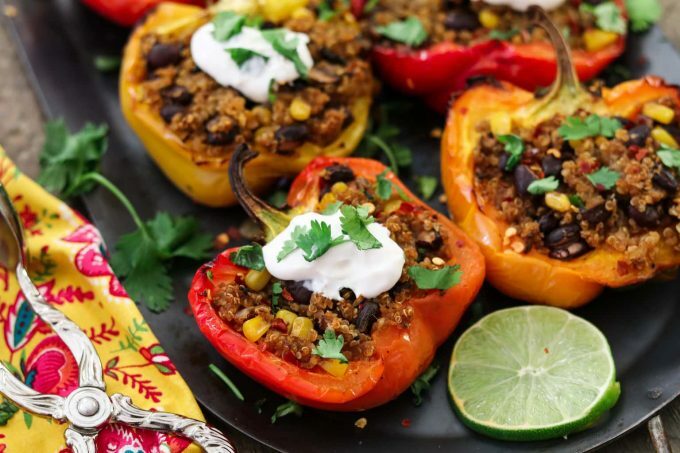 If you make these Quinoa Stuffed Peppers, I’d love to get your feedback. You can leave a comment below and let me know what you think. It would really make my day. You can also follow me on Instagram and share your creation with me. Just tag me @veganhuggs and hashtag #veganhuggs so I don’t miss it. Looking to spice up your weeknight menu? 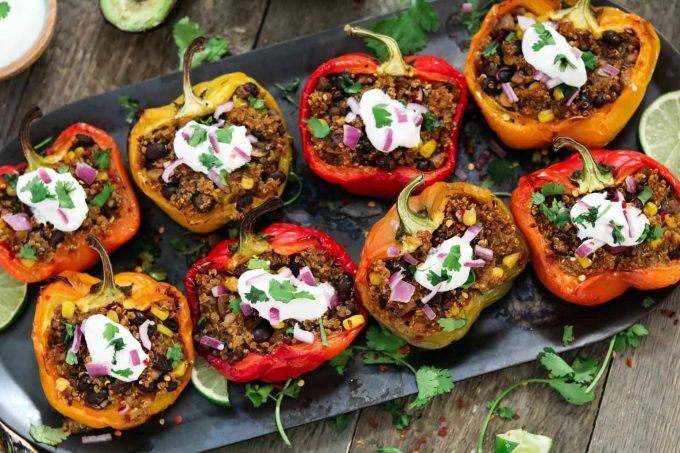 These Santa Fe Quinoa Stuffed Peppers will do just the trick. They are savory, smoky, subtly sweet and satisfying! Wash and cut each pepper in half. If the pepper has a stem, try to leave it intact. Just carefully cut it down the middle, leaving a piece on each pepper halve (this helps the pepper keep its shape). Remove membranes and seeds. Brush a little oil inside each pepper, and sprinkle with salt and pepper. Place, cut-side up on a large rimmed baking sheet (line with parchment paper) Roast until peppers are slightly tender, about 15 minutes. Remove from oven and set aside. While the peppers are cooking, start making the stuffing. In a medium pot, add the quinoa to 2 cups of low-boiling water (add a pinch of salt). Put lid on top. Cook until liquid is gone and quinoa is fluffy. This usually takes about 15 minutes to cook. Remove from heat and fluff with fork. Set aside. Heat oil in a large skillet, over medium heat. Add onion and sauté until translucent, about 3-5 minutes. Add mushrooms and garlic, sauté until mushrooms are softened, about 4-6 minutes. Add the tomato paste and spices, cook for 1-2 minutes. Stir often. Add the vegetable broth and bring to a simmer for 1-2 minutes. Add cooked quinoa, beans and corn. Combine well. Taste for seasoning and add more as needed. Cook for another 5-8 minutes, until liquid has cooked down. Stir often. Remove from heat and set aside. Divide stuffing mixture evenly among peppers, gently packing it down and making sure to fully fill each pepper. Place them upright on a large rimmed baking sheet (line with parchment paper or foil). Leave 1-inch between each pepper. Bake until quinoa is lightly browned and crispy on top, about 15-20 minutes. Topping Ideas: vegan sour cream, fresh-cut cilantro, squeeze of lime, hot sauce, salsa, avocado and diced red onion. *If you'd like the pepper to be more tender, let it cook 10 minutes longer. Cook less if you'd like a crisper texture. * You may have filling leftover. This all depends on the size of the peppers. You can save it for wraps, burritos, tacos, salads, a breakfast side or for more stuffed peppers. It will last in the fridge for 5-6 days or in the freezer for 2-3 months. I made these for my family tonight and we ALL loved them!! 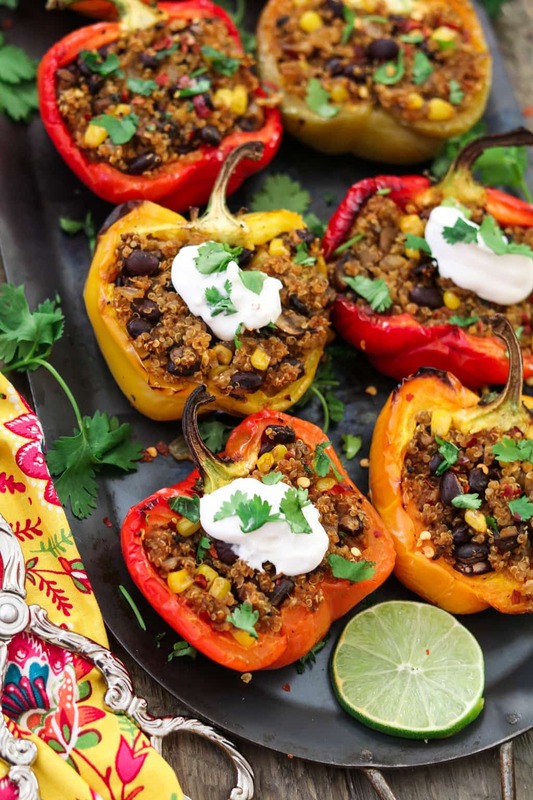 I’ve made stuffed peppers with green peppers and the meat and rice before, but these are WAY better! 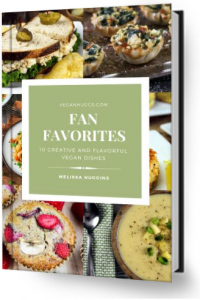 I’m always trying to find good meatless recipes lately and these fit the bill! I’ll be making them again for sure! Hi Joe, This is so nice to hear! I’m glad your family loved them 🙂 Thank you for sharing your feedback. Love the addition of peppers to the stuffing too. Great idea! I made these for dinner tonight and they were amazing!! I’ve never had stuffed peppers before but my husband and I loved them! We’re not vegan so we added sour cream and a bit of cotija cheese:) so good thank you!! Hi, Melissa! Thank you for making them and sharing your feedback. I’m happy you guys liked them. I first made them a few years ago, and I couldn’t believe how easy it was. I’ve been making them ever since. Have a great weekend! I made this tonight, and it was AMAZING! I did dice some tomatoes in it as well and used only half of the mushrooms because my husband is not a big fan. He didn’t even know they were in there so I will definitely use all 8 oz. next time. It was a hit by the whole family! Thanks so much! What can I use in leau of vegetable broth? I just made this for the first time and it certainly won’t be my last. They are delicious. I added a little chipotle with adobo and kicked up the spice a little. Made no changes, added a little more spice before stuffing, and my family loved them; thank you so much! Isn’t it fun to go back and update old posts? I’ve done that with posts that have gotten popular yet have embarrassingly bad photos. I can barely handle what my photos used to look like but it’s a good reminder of how far we’ve come! These peppers look fantastic, btw!